Phyllo purse at True Bistro. Unless you are vegan or vegetarian, you may not have heard of True Bistro. Generally overlooked by the mainstream (ahem, carnivorous) dining public, this small, white linen tablecloth restaurant in Teele Square, Somerville, has for the past five years been serving vegan fare so delectable it’s been mentioned on several lists of the best vegan restaurants in America. Sometimes you don’t know what’s in your own backyard. At True Bistro, the kitchen abstains from all animal products — meat, fish, poultry, eggs, dairy, and honey. Instead, chef Stuart Reiter uses a cornucopia of vegetables, fruits, herbs, beans, nuts, and proteins like tempeh (fermented soy cake), seitan (wheat gluten), and tofu to create dishes designed to please veg and non-veg palates alike. Plus, there are unspoken idealistic benefits: This cuisine aspires to simultaneously taste good and do good — for your health and the health of the planet. Can an Earl Grey martini of house-made, tea-infused gin help save Mother Earth? Count me in and sign me up for a tall Bermuda punch — mixed with Gosling’s Black Seal Rum, Mount Gay Gold and White rums, Grenadine and tropical juices — and an aromatic elderflower French gimlet. Not only are True Bistro’s cocktails vegan, but they’re priced several bucks below other, comparable restaurants’. Mystic Saison is a frizzy, bubble-gummy farmhouse ale brewed under the Tobin Bridge in Chelsea. Woo-hoo, it’s vegan too. The story goes that when owners Michael and Linda Harrison were unable to find a place where they and their friends could enjoy a plant-based meal in a cultured setting, they decided to open one themselves. With its slate gray walls, rotating display of framed artwork, fresh flowers on every (battery-powered) votive-lit table, and international jazz background music, True Bistro is an oasis of sophisticated dining that just so happens to be vegan. The menu is an assortment of daily soups, salads, and small and large plates. 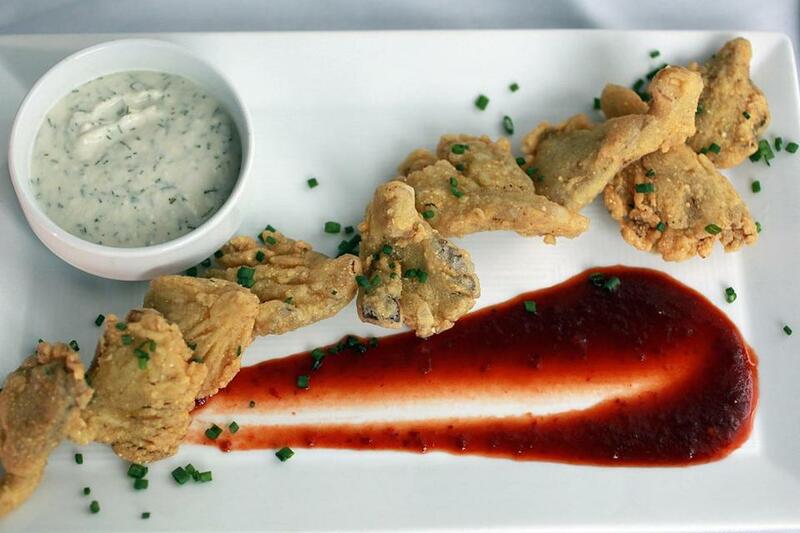 There are cornmeal-dredged, fried oyster mushrooms with sprightly horseradish-dill aioli. And crostini you pile high with tangy black-olive tapenade and tart pickled asparagus and red onions. Sautéed, Valencia orange-scented rainbow carrots, tossed with toasted almonds and rosemary, would send Bugs Bunny into paroxysms of pleasure. There’s a pleasant, unexpected clove undercurrent in the potato soup, a creamy (texturally) potage pockmarked with diced, smoked tofu. Italian white bean, kale, and tomato soup is stick-to-your-ribs vegan minestrone. A salad of shaved fennel, blood orange, and buttery (poetic license) Marcona almonds in Meyer lemon vinaigrette is citrusy and refreshing. Stir-fried asparagus, smoked tofu, and slivered, fried garlic is so delicious I’m going to try to replicate it at home. Cashews play a prominent role at True Bistro. Jamaican jerk-seasoned, roasted cashews are a crunchy counterpoint to a simple salad of Boston lettuce and mango with champagne vinaigrette. Soaked and pureed cashews become the basis of a cashew “cheese,” with a ricotta-like mouthfeel, which appears in multiple dishes. “Devils on horseback” — a reinvention of a late-19th-century Victorian hors d’oeuvre of baked prunes wrapped in bacon — substitutes Medjool dates filled with cashew cheese for the prunes, and smoked tofu for the bacon. Cashew cheese reappears in sunflower-yellow saffron ravioli, stuffed with roasted butternut squash and cashew cheese under a ladle of parsley pesto and sun-dried tomatoes. There it is again, crumbled and strewn with hazelnuts over a salad of roasted golden beets, fennel, and arugula, drizzled with Dijon dressing. Cashew cheese makes a final appearance as a smoky, ricotta salata-type alternative, grated over fluffy cauliflower-potato croquettes, in a pool of curried tomato sauce. Reiter has a solid vegan CV. He worked at legendary San Francisco vegetarian kitchens Greens and Millennium as well as at raw restaurant Roxanne’s, across the Bay in Larkspur, Calif. Before settling in Boston, Reiter lived in Europe, Asia, and Africa, which may explain the cross-cultural components in his cooking. If only the wait staff were better briefed about the details of each plate to answer questions from inquisitive diners who’d like to know the specifics of what it is they’re eating. Red-red stew of black-eyed peas and tomatoes. Red-red, a popular Ghanaian stew of black-eyed peas and tomatoes, is as colorful as its name. 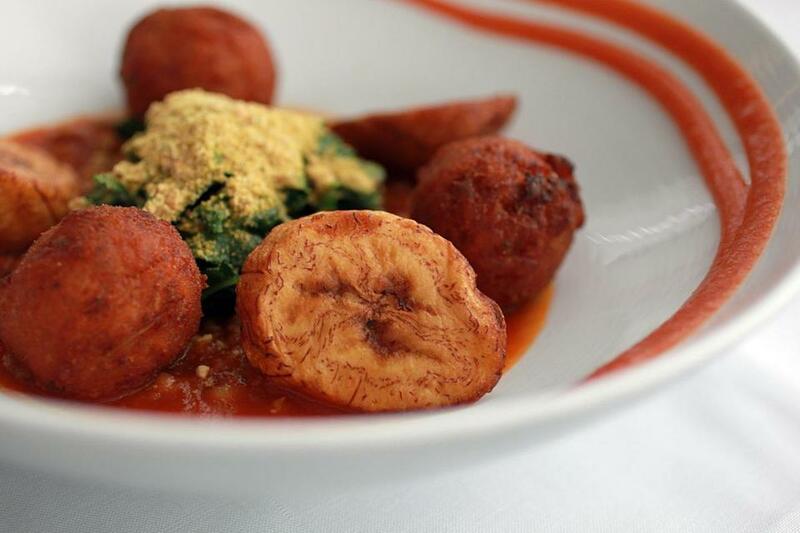 At True Bistro, Reiter adds arancini-style rice balls made from Jollof rice, a peppery West African pilaf, along with sautéed greens and plantains. 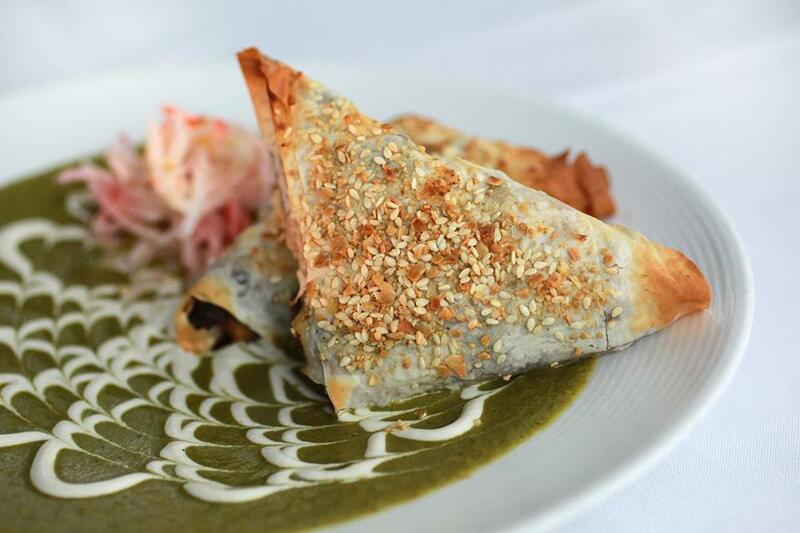 A green and white sunburst of chile-piquant mole sauce and cashew sour cream surrounds two plump phyllo purses, bursting with brandy-braised tempeh, roasted winter squash, and chopped dried cherries. Savory Thai red curry, dramatically decorated with a thick square of fried black rice, brims with potato, asparagus, mushrooms, and fried tofu. Tempura shishito pepper, squash, and mushroom are perched atop a comforting bowl of Japanese soba noodles in earthy shiitake mushroom broth. Skewers of spongy seitan are served, satay-style, with rice vinegary cucumber-radish salad, cumin-laced Indonesian peanut sauce, and crunchy, latticed pan-fried carrot and noodle cake. Isn’t wine made from grapes and therefore vegan? Not so fast. Apparently, most wines are filtered using a process that employs animal products. Don’t worry. True Bistro has a small but smartly curated wine list of (mainly organic) animal-friendly vinos. A 2014 ERA Primitivo Salento with notes of cherry and cocoa pairs well with the red-red stew and phyllo purse. A 2015 Cooper Hill Pinot Gris is an apricot complement to the Thai curry and seitan skewers. 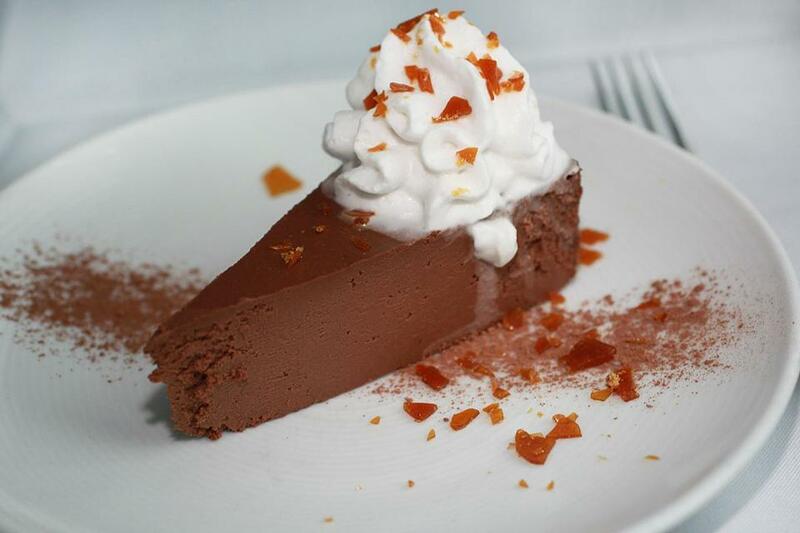 “Death by Chocolate” flourless cake. There is zero dairy cheese in the rich blood-orange cheesecake with its moist, almond-date crust. Nor cream in the scoop of vanilla ice cream on warm chocolate-chip banana bread. (The coconut-milk ice creams are from FoMu, made in Watertown.) Chocolate bourbon pecan pie, garnished with maple bourbon walnut FoMu, is a devour-every-last-bite remake of an old Southern favorite. Ultra-fudgy “Death by Chocolate” flourless cake with whipped coconut cream and smashed caramel brittle is a fabulous dessert that needs no additional explanation — or apology. Many non-vegans, myself included, secretly harbor the idea that a diet that eschews animal products sacrifices flavor on an altar of nutritional philosophy. True Bistro deliciously demolishes that stereotype. Mix me another Earl Grey martini and pass the red-red stew. What to order Cornmeal-crusted oyster mushrooms, saffron pasta ravioli, red-red black-eyed peas, phyllo purse, “Death by Chocolate” cake. 1153 Broadway, Teele Square, Somerville, 617-627-9000, www.truebistroboston.com. Prices Appetizers $4-$11. Entrees $17-$18. Desserts $7-$10. Hours Dinner Wed-Thu 5-9 p.m., Fri-Sat 5-10 p.m., Sun 5–9 p.m. Brunch Sat-Sun 10 a.m.-3 p.m.
Mat Schaffer can be reached at matschaffer@yahoo.com.